The Confluence Sensemaking Framework (CSF) is a tool your group can use to make sense of any situation in order to make decisions about it. Everyone in our community agrees that "revitalization" sounds good. But precisely what that means, and what we can do to create it, is something nobody knows. Everybody can see that the missed deadlines were caused by the people who set the deadlines. Everybody except the people who set the deadlines, that is. Is there a way we can move past blame and come up with some new ideas? Nobody will say it out loud, but we all know that there was a time when our customers were happier with our services than they are today. We need to take a good hard look at how things have changed and what we can do about it. Here is how to use the framework. First, assemble a group of a few to several people who want to talk about something of mutual interest or concern, a problem or issue or topic (like one of the examples above). Next, find a space to meet in either physically or virtually. If you are meeting physically, look for a room where you can put sticky notes on the walls or you can tape up large sheets of paper and put sticky notes on them. In a pinch you can use the floor or a large table, but walls are better. You will also need some large markers so you can write things you can see from several steps away. If you are meeting virtually, find a way to talk (over the phone perhaps) while everyone looks at a shared whiteboard together. If you can't all change the whiteboard drawing at once, choose someone to be a "scribe" and make changes while you talk. Decide on a situation you want to think about: a topic, issue, problem, dilemma, event, time period, opportunity, threat, challenge. Agree on what you will talk about and what you will put aside. Describe the situation to yourself. What is it like? How did it get that way? What could happen? Collect some material that will help you think about the situation. Draw from your own conversation as well as any other sources you think are relevant. Strive for diversity and completeness. Consider every dimension you can think of: personal and professional, new and old, expert and novice, emotional and distant, accepted and apocryphal, city and country, whatever matters. Write brief references on sticky notes: "neighbors find noise irritating" or "that day at the beach" or "our founding document" might be some. Make sure your references are short and written large, because you want to be able to step back and read them from several feet away. If you can, use different colors for different kinds of reference, like blue for opinions and green for events. Don't worry too much about making a perfect collection of references. You can come back and improve it later. But you should collect at least a few dozen sticky notes. Consider these contrasting situations of connection. In this first picture a central directorate (the seeing eye at the top) exerts control over the constituent elements under it like a big gear turning little gears. The elements are organized by the actions of an organizer. 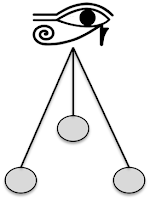 In this second picture there is no central force, and the constituent elements interact with each other like fish swimming together. Here we say the elements are self-organized since there is no one organizer. In any situation there is likely to be some degree of organization and some degree of self-organization, and this mixture will change over time. Consider a car sitting in a driveway. As a driver approaches the car, opens the door, gets into it and starts it up, the situation is primarily one of organization. The many mechanical and electronic components in the car depend entirely on the oversight of the driver. 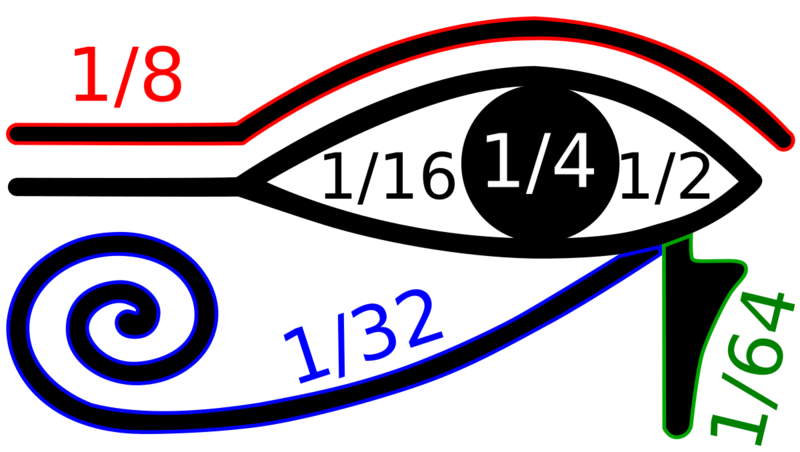 As the car begins to move, self-organization increases as fluids move within the car, air moves around it, and the road surface contacts the tires. As the car turns onto a busy road, the proportion of self-organization increases again as the driver begins to interact with other drivers. Consider a teacher in a classroom. At some times the teacher is a central directorate, holding the attention of every student as a demonstration is made or concept is explained. At other times the teacher may fade into the background as the students self-organize to discuss problems and find solutions together. Sometimes the teacher switches rapidly between direction and observation as the students begin a new self-organized activity. Every situation is filled with organized and self-organized connections like these, which shift and sift like grains of sand at the beach. We can draw the combination of these dimensions in this way. A dictator likes to keep things in the lower-right-hand corner, where they have complete control and the public has none. They also like it when there is no self-organizing going on, so they try to break bonds that form between people under them. In an emergency many connections break and nobody has control; that places the situation in the lower left. In a flock of birds each bird looks to its neighbors to get its bearings but nobody calls out "fly to the right for thirty more feet!" This places the situation in the upper left. When a beaver creates a dam, this has a constraining influence on the actions of many animals throughout the forest. This places the situation on the right-hand side of the space. A waterwheel combines elements of centralized force (in the design of the wheel and water channels) with constituent connection (eddies and flows in the water caused by localized differences in temperature and viscosity; objects and organisms in the water). That places the entire situation somewhere in the middle of the space. A hermit living in a cave might be said to live close to the lower right-hand corner defined by this space, since they rule their tiny world; but on the other hand they might be said to inhabit the lower left, since they have no constituent elements to rule. Which is it? Perhaps both? There are no easy answers here, which is as it should be. If you mark this space on a wall or floor or table, you can place your sticky notes on it. Just pick up each reference you have written, talk about where it seems like it should go, then put it there. If a thing seems like it should go in two places, or people can't agree where it should go, put it in two places. Write what makes it go into the first place on one note, and write what makes it go into the second place on another note. Do this for all the material you have collected. If this doesn't make sense to you, try it anyway. Place some things and see if it helps you think about them. Make sure you are talking about where things should be placed and not just filling the space without thinking. If you are confused, if you don't know where things should go, if disagreements erupt: that's good. You are thinking. If the pictures or terms given here don't work for you, translate them to words that mean more to you. What does organization mean to your group? What does self-organization mean? You have been building a landscape of the situation you are considering. After a while you should start seeing features of that landscape begin to emerge. Some areas are likely to have more sticky notes in them than others. The sticky notes in some areas might be similar in some way - they all have to do with dogs, for example, or they all represent official documents. Map the space. Do you see boundaries between spaces? How can you describe those? Are they strong or weak boundaries? Are they sharp or gradual? What other distinctions can you see between different areas and boundaries? As you notice features, mark them on the space using other sticky notes, larger pieces of paper, string, tape, chalk, whatever captures what you see. What if you don't see any landscape features at all? Go back and look over your collection of material again. Can you add more diversity to it? Have you missed anything? Maybe you didn't consider alternative views or left out trivial facts or didn't want to get into sensitive areas. Plumb the depths of the situation, then come back and see what you find out. When you feel your landscape is complete (or complete enough, for the perfectionists), start telling each other what you have found. Pull together all the features you have discovered and tell yourself the story of what your landscape means. Why is this area stronger than that? Why is there a boundary here and not there? What does it mean about the situation? What does it mean about what you should do? If you like, bring a time element into the story you tell. What has changed over the past year or decade or century? What happened? Can you show that on the landscape you have created? What could happen in the future? If you like, you can build up to four more detailed landscapes using sub-frameworks nested inside the one you just used. After you have built your first landscape, you should be able to choose which of these sub-frameworks suit your needs. Each sub-framework follows the simple plan of its parent: it defines two spatial dimensions on which you place sticky notes in order to watch landscape features emerge. The organized sub-framework applies to aspects of systems in which central control is important. It increases in utility as you move horizontally to the right in the main confluence framework. 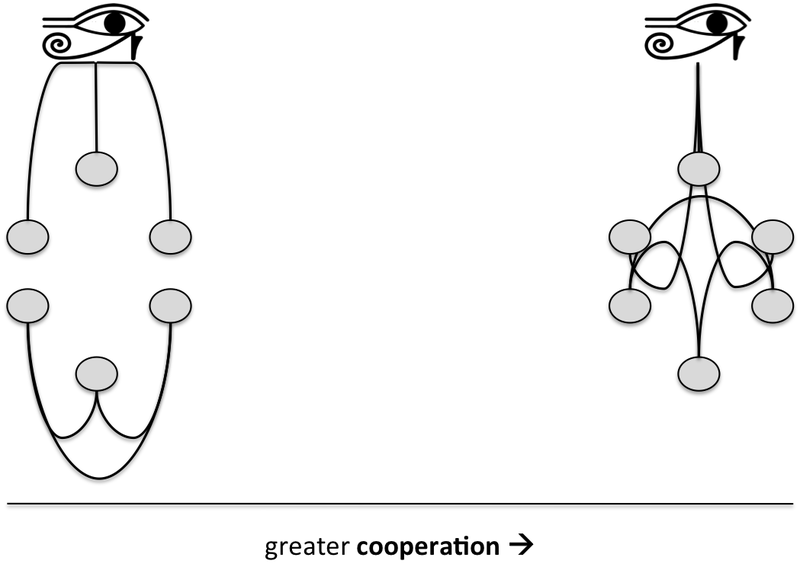 The self-organized sub-framework applies to aspects of systems in which constituent connection is important. It increases in utility as you move vertically upward in the main confluence framework. 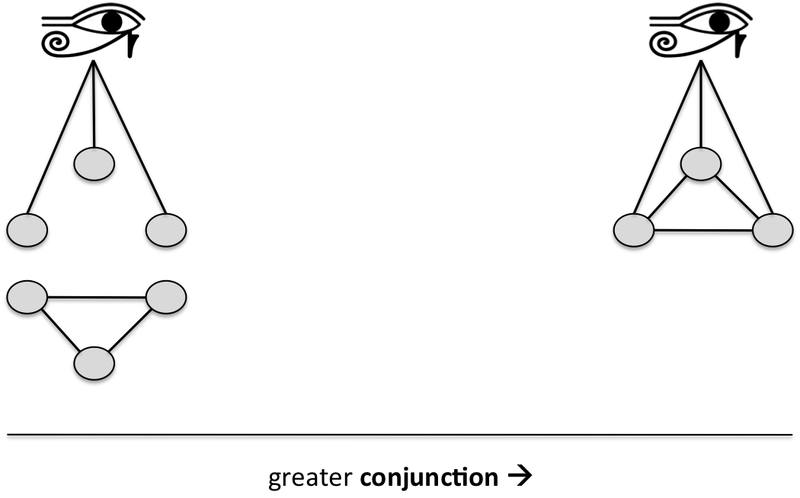 The mixed sub-framework applies to aspects of systems in which central control and constituent connection are intermingled. It increases in utility as you move diagonally toward the upper-right-hand corner of the main confluence framework, where organization and self-organization mix most strongly. The uncanny sub-framework applies to aspects of systems in which neither central control nor constituent connection are evident (thus the events that take place appear to be uncanny, or difficult to explain). It increases in utility as you move diagonally toward the lower-left-hand corner of the main confluence framework, where both organization and self-organization are weak. some new notes on things you didn't think of before but that seem useful now. Then place, map and tell again. That's all there is to it. When you have finished, you should have given yourself food for thought that will inform your decisions. Consider these contrasting situations of organized connection. This is a distinction in constraint. 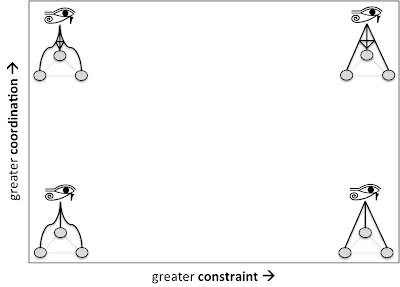 In both situations the central directorate holds a leash that controls its constituents, but on the left the constraint used is loose and on the right it is tight. You may have seen such a tight leash, called a "catch pole," used to control wild or out-of-control animals; the rigidity of the pole keeps the animal a safe distance away from the animal control officer. 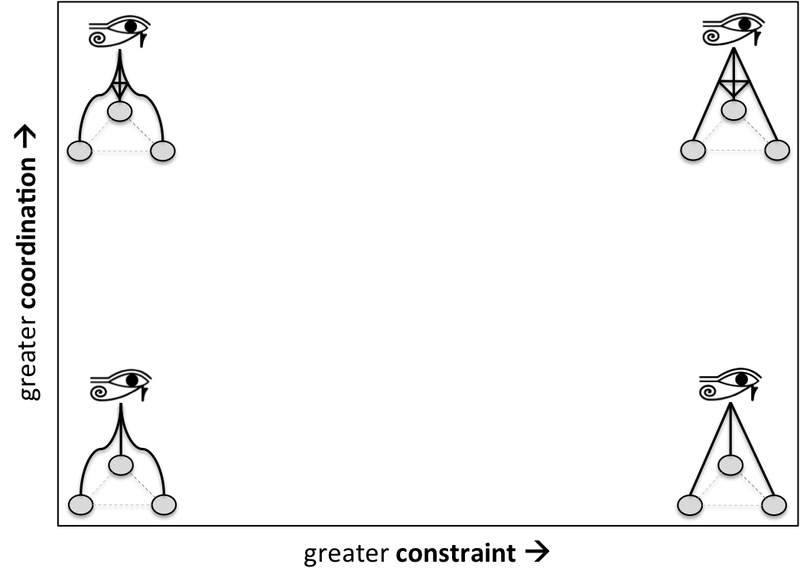 In many situations of organization (and organizations) there is a range of variation between tight and loose constraint. Another example is the difference between a manager who checks his subordinate's work every hour or every week. The leash is there in both cases, but it can be tight or loose. Now consider this dimension of organization. This is a distinction in coordination. On the left the central directorate controls each subordinate but does not coordinate their interactions with other subordinates. On the right the central directorate places controls on the way the subordinates interact with each other. This might remind you of the way governments regulate the interactions of businesses, or the way teachers control interactions among children, or the way carpenters brace parallel boards and weavers chain parallel threads to order their relations with each other. A manager trusts her employees to work at their own paces, but she does mandate that they participate in a weekly group meeting. Her management style could be placed somewhere in the top left area of this space. The dogs can interact however they like, but they all must obey their owner, placing the situation in the lower right. Government regulations control the behavior of individual corporations and (to a lesser extent) the ways in which they interact with other corporations, placing the situation somewhere along the right side of the space. 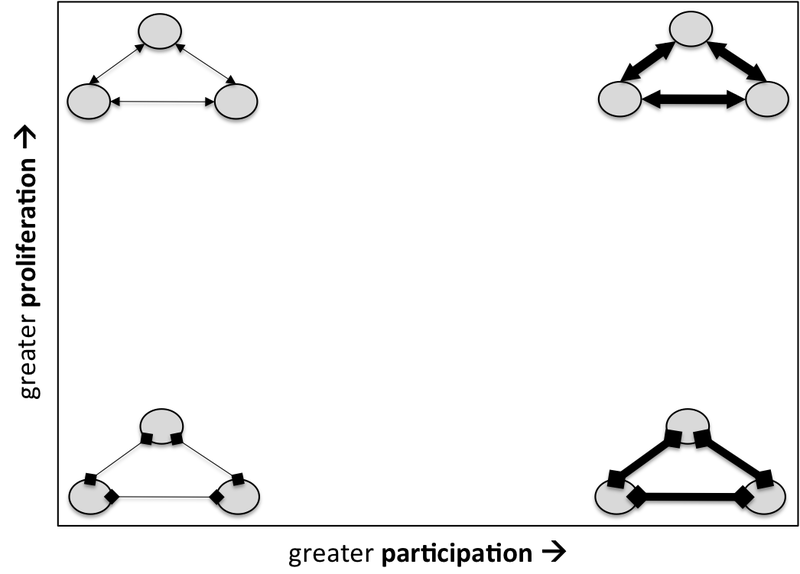 If you consider the way the constituent elements in a system (not a central directorate) interact, you can think about the degree of participation in that interaction, thus. When participation is weak the elements share little of themselves and are aware of little about others. 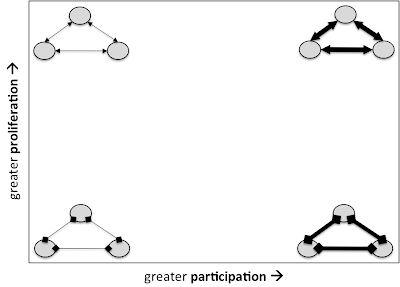 On the other extreme, participation in a system can be so strong that it can blur boundaries between elements. When people say "I don't know where I end and she begins" that's strong participation. Now consider another dimension of self-organized connection: proliferation. Imagine snapping a towel or cracking a whip. Think about how the wave you start moves across the surface very quickly. Now think about trying to do that with a sheet of something thick and rubbery, like roofing material. The wave doesn't move quickly and might even die out before it reaches the other end of the material. We can draw the distinction like this. On the left energy, information, or momentum does not proliferate but slows down and stops like a heavy ball rolling across wet cement. On the right much of what is in one place travels to other places (and bounces around), so things spread quickly. Putting those two dimensions together we get this space. Twitter tweets travel far but tell little; this places them in the thin-and-fast upper left corner. Reading novels written by people long dead is an immersive, time-consuming activity that requires intense participation on both sides. But the proliferation of ideas through novels happens in decades, not minutes. This places it close to the lower right corner. Influencing public behavior through signage is a difficult task. You only get seconds of people's time, and people don't usually rush out and tell everyone about a sign they saw on the road. It is a lower-left activity, thin of participation and slow of proliferation. Consider these mixtures of organized and self-organized networks. 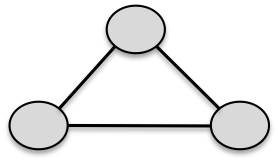 On the left the two types of connection are disjoint: no element is connected in both an organized and self-organized way at the same time. 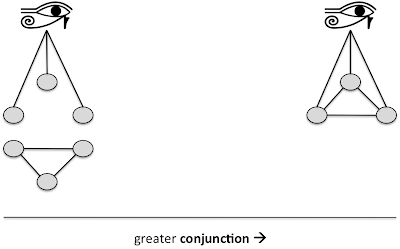 On the right the two types of connection are conjoined: at least some elements are connected in both ways at once. 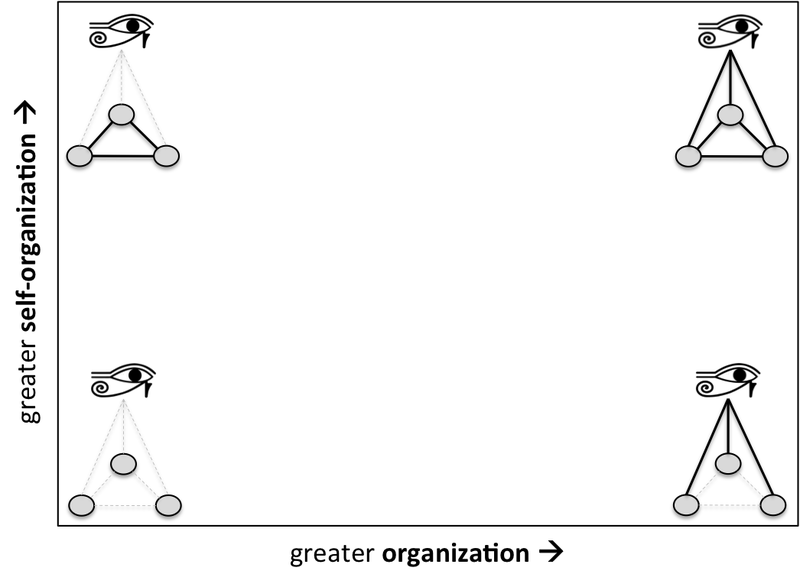 Now consider this dimension: Do organization and self-organization cooperate? Do they work with or against each other? 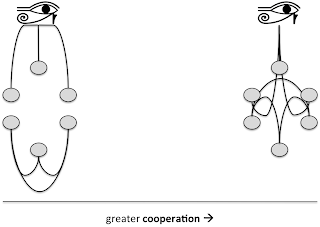 On the left the two networks rush away from each other, but on the right they rush together and cooperate to do useful things together. The space of these two dimensions looks like this. Some of the government authorities who defected to the rebel side during the war have offered to help form the interim constitutional commission. Because of their position navigating both the old bureaucracy and the popular uprising, they bridge both groups, which are conjoined into citizenship of one country. This places them at the central point of the diagram in the lower right corner of this space. Grandma calls the shots around here, but we all love her, and besides we grandkids can gang up on her if she gets too annoying. You can find us somewhere in the upper right of this space - conjoined and cooperating. The farmers in this area have an unspoken agreement never to comply with the official regulations on reporting agricultural output. We've tried to reach them, but no farmer's child becomes a bureaucrat and vice versa. The networks are separated by a gulf, which puts us in the lower left of this space. This sub-framework is for situations, or aspects of situations, where it's hard to tell what is going on; and when it's hard to tell what is going on different people come up with different explanations for what is going on. For these reasons it is best used to work not with conditions or facts but with perceptions, beliefs and fears. If you consider how explanations of uncanny events vary you can think of two dimensions. The first is of agency: Who is responsible? On the left all elements in the system, including the central directorate, are enveloped in and controlled by a phenomenon that guides events, like the plate tectonics of the earth's crust or long-term weather patterns like El Niño. 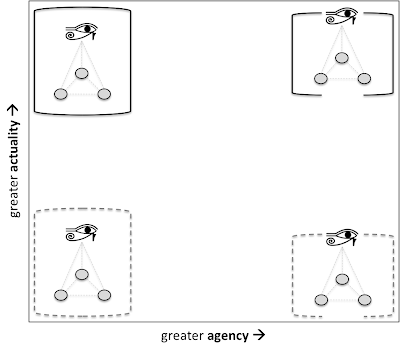 On the right the seeing eye guides events, but not by directly contacting the other elements in the system; by controlling something about the environment through agency. A city planner might exert such agency by building the roads and sidewalks of a town in such a way that they guide interactions indirectly, so that things happen that seem to have no evident explanation. Now contrast a second dimension of perception, that of actuality: Is it real? At both extremes of this dimension we see the same phenomenon as in the previous comparison: a phenomenon impacts all elements of the system including the central directorate (either image would work, of course). On the left the phenomenon is not actual but false. Falsity here can include explanations that are illusory (like phrenology or ether or any of the other explanations for natural phenomena we now regard as erroneous) or simply inadequate. When our explanations are inadequate we know something is happening, but we have no explanation, illusory or otherwise, and remain confused. We do not, however, attribute the events to agency. 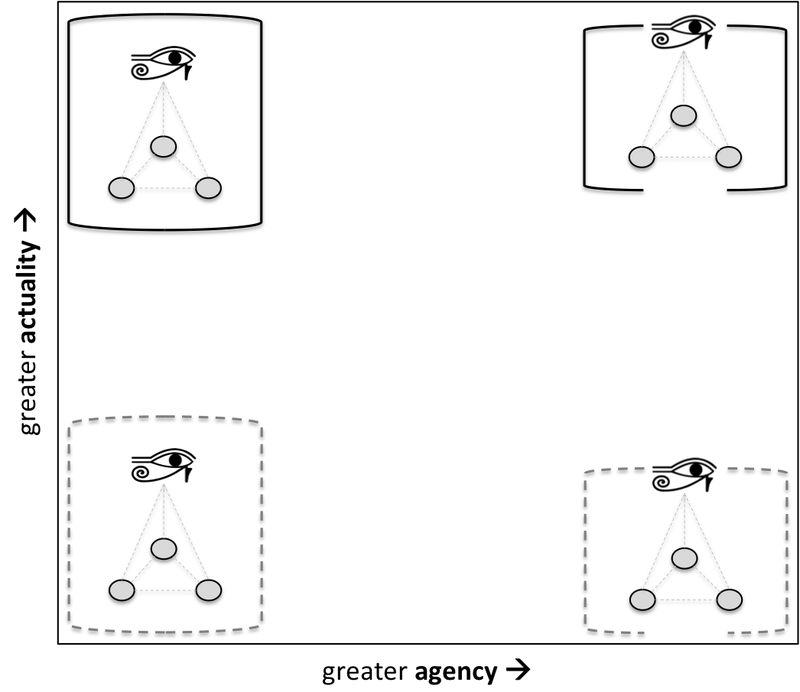 When agency is perceived, falsity may involve illusion and confusion, but it may also involve deliberate deception, sometimes mixed with self-deception. Putting these two dimensions together we get this space. When the Brooklyn Bridge was being built, men working in underwater caissons (support structures) suffered from what was called "Caissson disease." We now know the condition as the bends and know that it was caused by rapid changes in air pressure as the men entered and left the pressurized caissons. This places the situation in the lower left corner of this space. Some people have attributed earthquakes, tsunamis and other environmental catastrophes to the hand of God doling out punishment for human behavior. These people would locate the situation in actual agency at the extreme upper right corner of the uncanny space. In the old television show Scooby Doo, the team often encountered uncanny situations. For a while they floundered in the lower sections of this space, encountering scary "ghosts" and other unexplained events, but by the end of each episode the group always traveled up the space into either an actual natural phenomenon (upper left) or the deceptive agency of a criminal trick (lower right). To conclude and summarize the framework, I repeat it here as a simple series of questions about a situation. To what extent are the elements in this situation organized by a central force? To what extent do they self-organize without any such force? Where a central force operates, does it loosely or tightly constrain the actions of subordinate elements? To what extent does it coordinate the interactions of subordinate elements? Where elements organize themselves, do they participate weakly or strongly with each other? When an event happens to one element in the system, to what extent does it proliferate to other elements? Where central organization meet self-organized activity, do the two sets of connections conjoin in the same individuals or remain separate? 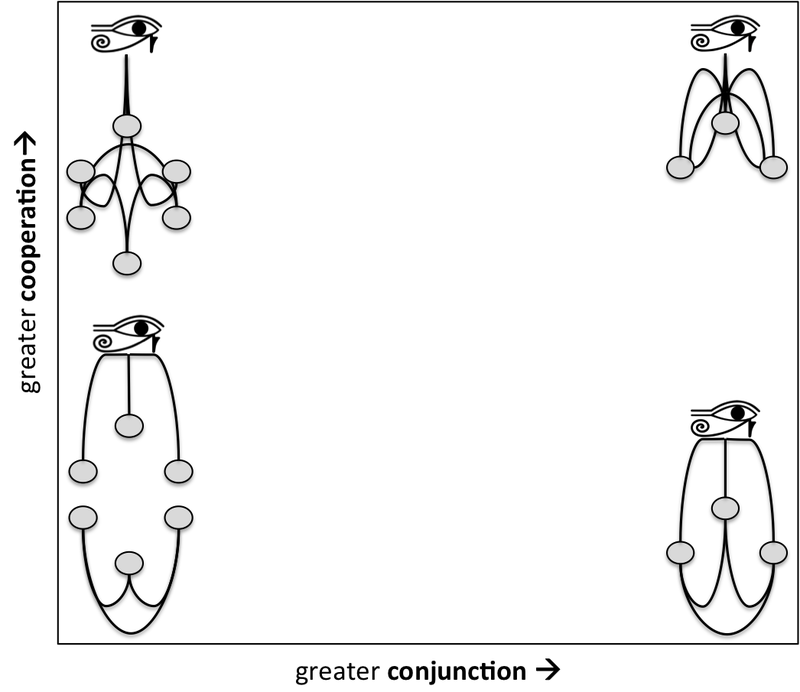 Do the sets of connections cooperate or do they work against each other? Where there appear to be no connections that can explain events, organized or self-organized, how do people answer these questions: What agency is responsible for the events? And are the events actual or false? A few final things to remember about the CSF. This is an aspective framework, not a categorical one. None of these questions present bins or buckets or any other kinds of mutually-exclusive categories. If you find yourself drawing lines or placing things into spaces as though they were boxes, stop doing that. If you find yourself considering whole situations when they can be described in multiple ways or from multiple viewpoints, stop doing that. You will reduce the utility of the framework if you use it as a pigeonholing device. By all means draw boundaries and isolate areas, but do it as a result of the sensemaking, not as a replacement for it. This is an adaptive framework. If these terms don't work for you, talk about them. Talk about what they mean to your group. You can translate them to new terms, and you can even come up with new dimensions that make more sense to you. This is not a dogma, it's a tool. Feel free to change it to suit your use. This is a sensemaking framework, not an analytical device. You cannot use it to arrive at answers. In fact, if you don't have more questions after you use the framework than before, you haven't done it right! This and all other sensemaking frameworks should open discussion, pull apart assumptions and surface problems. If you've used this framework and made a mess of things, congratulations. You've done it right. This is a resonant framework. It is not original but rediscovers and re-presents ideas that have surfaced in many other sources of wisdom, both contemporary and ancient. All of the following frameworks and sets of ideas complement this one and are worth looking at. So that's it, the Confluence Sensemaking Framework. Use it! Improve it! Make it your own! Please send questions and suggestions to cfkurtz at cfkurtz dot com. This document is licensed under the Creative Commons Attribute-ShareAlike 3.0 Unported license.